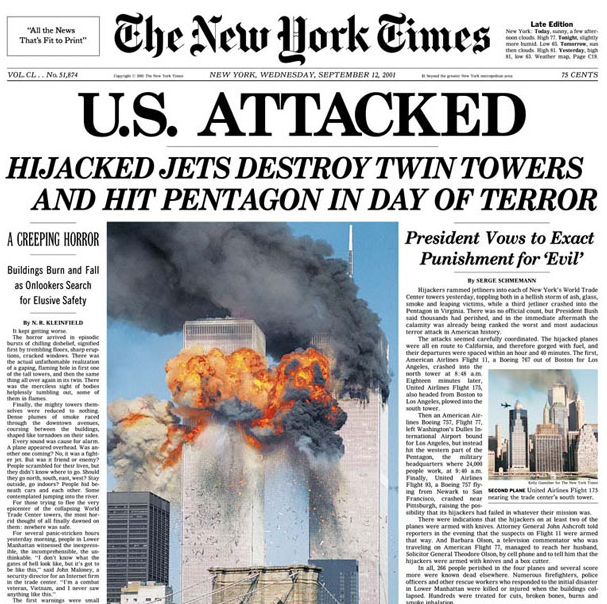 The front page of the New York Times on September 12, 2001, above the fold. There is no peg to this story except that yesterday was an anniversary. Today is just a regular day. Today is the day after a day that 11 years ago meant something. But today, we don’t know what that something means anymore. “Where were you on 9/11?” countless news organizations tweeted yesterday. “Share your story!” Remember with us, they asked. Other media groups got criticized for not remembering it enough or in the right way, to the benefit of blogs like New York magazine’s Daily Intel. They took advantage of NBC’s choice not to observe a moment of silence yesterday morning when other news networks were doing so and instead air an interview with Kris Kardashian discussing her choice to get her breast implants replaced; Daily Intel’s well-edited split-screen with audio of the different channels playing at the same time is, I would say, surprisingly and masterfully comical. I don’t necessarily blame NBC for their now-obvious gaff; it’s hard not to notice the difference in 9/11 coverage between this year and years past. Things are drastically less September 11th-ed out. Powered by my admittedly faulty memory, I like to visualize the intensity of the coverage of 9/11 in the years since that date slowly falling like an inverted bell curve, and then peaking suddenly back up with the 10th anniversary, to fall quickly back down this year. “Some anniversaries offer a natural reflection point,” Carolyn Ryan, the metropolitan editor of the New York Times told the paper’s new public editor Margaret Sullivan Tuesday (I will remind you, in case you have forgotten, the original 9/11 was a Tuesday). She was referencing 2011’s 10th anniversary. That natural reflection point that is natural only to us as humans, with our desire for nice round, even numbers that give us something to mark the meaningful passage of years. Given that, and the inevitable passage of time, it seems unlikely that we’ll “remember” with the ferocity we have those first 10 years. I’d posit a guess that the 10th anniversary was the most we’ll ever hear of 9/11 again. Pearl Harbor, the death of JFK -- these things that define generations live only in the memories of those that experienced them, to be retold to others who simply cannot, and honestly don’t want to understand the emotional intensity involved. Though even those who live through an event at the same time can’t often share about it properly or correctly. There are those that are told they remember the wrong way. (There are those that tell themselves that they remembered or felt the wrong way.) The companies that exploit events for profit or goodwill. The celebrities that make anniversaries less-than-serious, almost meaningless. 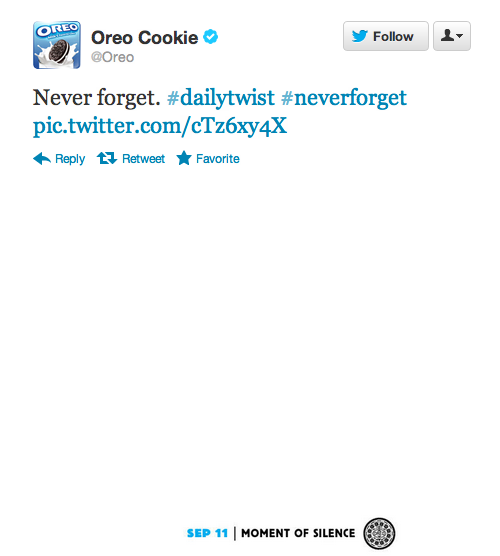 Videogum editor Gabe Delahyde hilariously (to those of us who appreciate the humor of a publication like The Onion, who famously “Onion-ized” 9/11 coverage) spent much of today retweeting every horribly meaningless platitude that celebrities and companies like Oreo shared about the anniversary today. Anniversaries give us a time. They give us a space. They tell us “it’s okay to do this today.” They give news organizations a structure, a peg, a reason people will read, listen, look or watch their story, no matter how potentially mundane the topic. They prove how much time has passed and how little or much we have changed. They also prove our value to others. Relationship anniversaries, the anniversary of someone’s death -- these things back (and sometimes subvert) our claim to feeling a certain way. The best way I can ever tell that I’m experiencing time normally, the way humans are intended to, is when something feels both forever ago and yesterday. Not so many people were asking whether we’re remembering 9/11 too much last year, the way we have this year, until we won’t have to ask it anymore because we just won’t be doing it. Some were tired of the stories, sure; tired of the difficulty in coming up with original and actually meaningful content. But that’s because there’s no good way to anniversary anything, except maybe by yourself. And it’s peculiar, because perhaps today is the day we should really count as an anniversary. Today is the day I woke up in an apartment that wasn’t mine and wandered around downtown Manhattan with my mother, looking for coffee and a copy of a historic paper that would be impossible to find because everyone wanted it. It was beautiful out, just like September can be. No one was on the streets. It was unnatural, it was eery, it was remarkably terrible. A week later, I was uptown and it was like nothing had happened. Nothing had happened or was remembered except by me. Oh, but that’s my story. It doesn’t much matter, expect as a peg. On a year that counts just right.